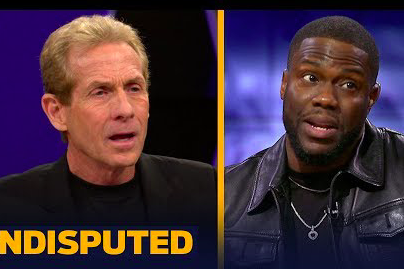 Kevin Hart joins Skip Bayless and Shannon Sharpe on FS1's "Undisputed." As a more or less self-proclaimed ambassador for Philadelphia sports, Kevin Hart's fame allows him to represent the city's collective position on various issues concerning the Eagles and Sixers. No one's actually ever heard him talk about the Phillies or Flyers, but that's alright. From time to time, Hart joins his frenemy Skip Bayless — who even appeared on his "Cold as Balls" web series last year — to discuss the state of Philly teams. This usually involves Hart teaming up with Shannon Sharpe on "Undisputed" to discredit's Bayless' Cowboys-tinted analysis of the Eagles. A Friday appearance on the show went much the same for Hart and Bayless, except that they finally agreed on one longshot. They both think the Sixers are going to win the NBA's Eastern Conference, and possibly a championship. Hart shares his thoughts below on the Eagles' options with Carson Wentz and Nick Foles, the Sixers chances against the Celtics and more. If you enjoy the odd dynamic of these two bickering, knock yourself out for the next 20 minutes.